We love that a Chinese VIP’s visit to Austin is a special thing. 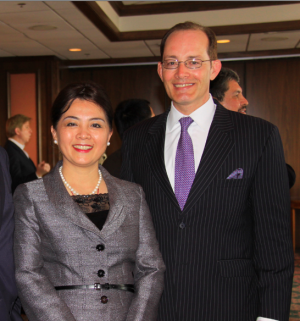 Recentlyformer Texas Secretary of State Geoffrey Connor hosted a reception at the tony Headliner’s Club honoring Xu Erwen, the Consul General of China to introduce her to some of the city’s outstanding local contributors of culture. Connor knows diplomacy. He’s spent his entire career honing the finer art of international relations and has led many delegations to many countries creating goodwill for so many. 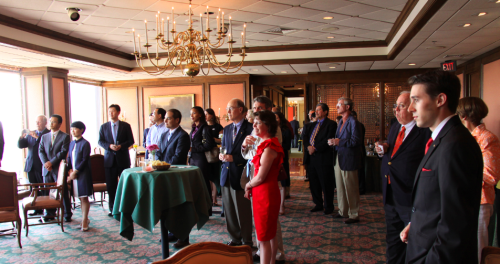 This special occasion had Houston-based Erwen, whose husband is also a diplomat, speaking about her experiences here and in China. Her territory covers many Southeastern states and she was also quick to mention how much of a friend Connor has been to China, as well as so many other countries. Guests nibbled crudités and sipped cocktails while chatting with new and old friends. Seen in the crowd were celebrity photographer and TV producer Gray Hawn, PR wiz Betsey Christian and lawyer Brandon Janes of Jackson & Walker.